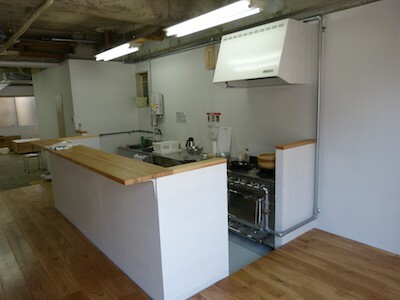 20T is a user-friendly business inspiration in downtown Hiroshima: It can be used as a rental kitchen, dining area, party venue or even a DIY workshop space. You can make bookings any day of the week between 10am and 10pm, for reasonable hourly rates. For many people who would like to have a party for a group of friends, but don’t have the space to host a house party- 20T is a great option. It officially opened in April of 2015 and has been booked for cooking lessons, parties and get-togethers. The back DIY area has been utilized for painting and wallpapering DIY workshops. There is a lot of potential to put your creative ideas and plans to good use at 20T. 20T means “Nijyu-Tsubo” in Japanese which is the measurement of the rental space by traditional Japanese standards. The kitchen and dining area is an open-dining plan with a beautifully laid wooden floor. In the kitchen, there is a professional grade gas range, oven, all the necessary cooking pots and pans as well as enough plates, glasses and utensils for 20 diners. After use, renters are asked to clean up and leave the facility as you found it, however as a part of the rental service, there is a garbage area where you can separate and leave waste. There is also a fridge and freezer available for use. Entrepreneur designer owner, cooltiger, has many great contacts and is happy to make introductions for you to a variety of chefs and Sake and Beer brewers who could help you host special dinners for your guests featuring delicious foods, fantastic local Sake and Japanese micro-brews at 20T. Conveniently located along the main road, just over the bridge from the A-bomb dome (Peace Park). 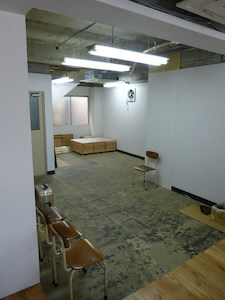 It is on the 3rd floor of the building, climb the stairs next to Sprout restaurant. Look for events coming up at 20T.